For the past one month Ukraine has found itself at a crossroad and based on the plentiful accounts in the media, the country has only two choices in terms of direction—Europe or Russia—one of which should lead to prosperity and the other to further degradation. Since November 21, Independence Square in Kiev has been overtaken by protests against the current President, Viktor Yanukovich, and demands for his resignation abound. 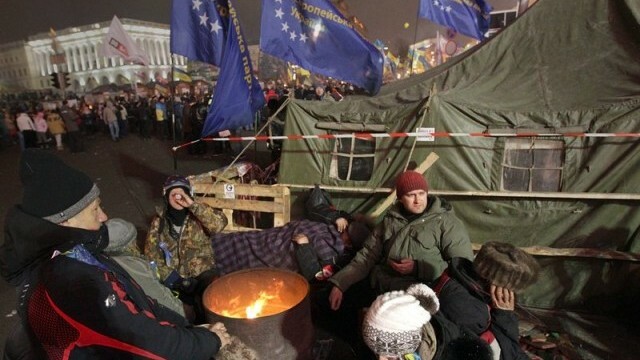 The protests are a consequence of the president’s failure to follow through with the EU-Ukraine Association Agreement. The deal could mark an important step toward European integration for Ukraine and the suspension of talks between Yanukovich and the EU under the alleged insistence of Russia highlights the biggest obstacle to a smooth process. The protests have largely been peaceful, but on several occasions the situation escalated. On November 30, for example, witness reports confirmed beatings by riot police and prompted various human rights organizations, such as Human Rights Watch (HRW), to voice outrage at the police brutality against civilians and journalists. HRW has subsequently demanded a thorough investigation, but while the ruling party acknowledged the complaints, it also dismissed them as unnecessary and as the means to cause panic and chaos. On December 8, the statue of Vladimir Lenin was toppled as protesters voiced their intention to eliminate Soviet influence from their country. Russian officials have reportedly expressed surprise over the attention the situation in Ukraine has attracted both domestically and internationally. First, the increased tensions reflect the polarization between European and Russian economic pressures. Claims abound that President Yanukovich’s decision became a reality after significant push from the Russian President Vladimir Putin. Indeed, while Western leaders have threatened Ukraine with possible economic sanctions, a BBC report indicates that Yanukovich and Putin have reached an agreement that would lead to significant economic assistance from Russia. The bailout package is expected to pull the Ukrainian economy out of the gutters and “keep the country from bankruptcy next year”. Putin’s desire to alleviate the struggles of the Ukrainian economy is seen as a clear sign of his intention to keep Ukraine close and the European Union at a distance. Second, the protests in Kiev are a perfect example of a generational rift: the younger generation tends to support the idea of a united Europe and a common European identity while the older generation insists on strong connections with Russia. Older generations, having lived though the impact of another union, the Soviet that is, seem a bit more skeptical as to the impact the EU could have and voice concerns that the independence of their nations is still in jeopardy. Conversely, the younger generation is fed up with the difficult economic situation in their native countries and see accession to the EU as an opportunity to move West and find better jobs. Interestingly, the two most prominent characteristics of the developments in Ukraine correspond to the two ideals behind a united Europe—economic interdependence and a common identity. Economic integration was the major focus of the European Coal and Steel Community and the European Economic Community (EEC), precursors of the EU, with the idea that those bound by economic interests will not be concerned with waging a massive and murderous war against each other. For a while, Europe seemed to be on the way to a bright future marked by peace and economic interdependence. Another, and a bit more problematic, theme accompanying the establishment and enlargement of the EU is the search for the so-called common European identity. A shared cluster of characteristics, distinct to Europeans, is expected to smooth and ease the ultimate integration of all European countries into a community living harmoniously. As Delanty points out, however, this concept of a common regional identity sprouted out of and has been sustained by separation rather than by integration and peace. It is also important to acknowledge Peter van Ham’s observation about the enigma of what exact values, beliefs, and shared hopes would constitute the roots of this budding European identity and the likelihood of such an identity to allow Europeans to feel socially connected on a larger than the commercial level. The intention is for a diverse group of nations to come together under the umbrella of Europeanness and exist and prosper as one body. Moreover, a certain ‘European Gemeinschaft’ is viewed as a necessary prerequisite for the successful enlargement of the EU. It is not clear, however, whether the European identity already exists and the path toward integration is meant to solidify that identity or if the integration itself is supposed to create and reinforce the so-called European identity. The ultimate hope is that an emphasis on a common identity, along with economic interdependence, would reinforce the unification of European states and turn Europe into a powerful actor on the global stage. In the last two decades it has become painfully clear that with former communist republics seeking admission, the two EU pillars of economic stability and common European identity are threatened and a truce is unavoidable. The idea of a united and strong Europe might still just be that: an idea. In Ukraine, some emphasize, what stands out is “the imaginary Europe that has captured Ukrainians’ minds”. A common market and identity that can keep nations together can only work if a basic level of economic and social development already exists. The original member states relied on and acted out of a shared political and economic template that was not what the new members are familiar with. The economic disparities between the long-time Western members and the new Eastern members place a strain on the union and jeopardize the hopes for economic stability across Europe. Indeed, a discussion about European disintegration has become prominent, especially in the first decade of the 21st century. Support for the EU and its mission has fallen in several of the more powerful European states such as Britain and France. No doubt the region referred to as Europe is comprised of significant cultural, political, economic, and religious diversity. To have these distinct areas join into a united supra-national organization will take effort, time, and most of all compromise. The economic differences are so enormous that the integration under a common market seems unlikely. Former communist nations have standards of living that are at least 40 percent lower than the standard of life in older members of the EU. Political differences are also significant and while the early accepted Baltic nations are working hard at developing stable democracies, many nations in the Central and Eastern region have found themselves in more repressing regimes than at the end of the Soviet era. Different economic standards ultimately result in distinct ways of life, diverse beliefs, and a color palette of worldviews that in turn create issues with the concept of a united Europe. While language diversity is respected in the union, the cultural and social history it is accompanied by has so far not faced a warm welcoming. In terms of geography, all EU countries technically belong under the umbrella of Europe, but in terms of culture and way of life, not all within the confines of the old continent feel European or are treated as such. While demanding respect for all members within a specific state, the older members of the EU have yet to show a similar practice toward EU citizens across the EU regardless of their country of origin. Ultimately, what is crystal clear is that former communist nations in Europe will not be left alone—either by the EU or Russia. Both powers claim to advocate for the small sovereign nations to be allowed to exert their independence, but no one really lets them make the decision on their own. A country is left to choose between the influence of one big entity over another and who is to say what choice comes with more negative consequences. Considering the continued economic hardships, the high corruption levels, and the escalating mistreatment of immigrants in the West, it is no surprise that some in the newest EU members believe that one repressive and discriminatory regime has simply been replaced by another. Former communist nations are treated like immature younglings who need the guidance of an adult to mature and civilize. Whether that adult is the European Union or the former Soviet Union is truly irrelevant. Churchill may have believed that building “a kind of United States of Europe” is the future of a prosperous Europe, but after over sixty years of hard work and construction, the road to a united Europe still resembles more the Soviet era remnants dissecting Eastern Europe than a German autobahn. As a person who has been on both, I must admit, I am not a fan of either. There are 55 billionaires on the continent of Africa. That was the big news from Ventures magazine just about one month ago, when Ventures Africa reported a list of the richest people in Africa. The total number of billionaires, much higher than reported by Forbes in previous years, combined to a total worth of nearly $144 billion. The billionaires themselves live in just 10 of Africa’s 55 independent countries. This “news” was reported across various media outlets, in essence cheering on the new development and focusing on personal stories of the individual entrepreneurs who made the list. My gut reaction to the news was strong. In essence it was: “Why the *&%$ does this matter?” Of all the economic news both good and bad, the personal stories of triumph or despair that could possibly come from this vast continent, why should I care about the existence of a few incredibly wealthy individuals? What does this mean for the other billion or so people living on the continent? Most of the reporting, thanks to due diligence, did make mention of the numbers of people living in poverty on the continent, and referenced the debate over growing income inequalities in many African countries. But when the World Bank reports that the number of people living in extreme poverty on the continent of Africa rose from 205 million to 414 million over the past three decades, is just a mention of the debate on inequality enough? To me, absolutely not. But clearly, others would disagree with me. Many would see the existence of billionaires to be extremely positive, as evidence of strengthening capital markets, and the promotion of regulatory systems that allow for entrepreneurship. While these trends may be true, I believe what should matter when discussing things related to economic development is the plight of an everyday person, not a rich outlier. Don’t get me wrong. I’m not rejecting the notion that the ability of 55 people to become billionaires represents some positive economic trends. I am also not complaining about this news because the reporting portrays Africa in a positive light. What I am rejecting is the dichotomous portrayal of Africa (in this instance, in the media) as either “Africa on the rise” – a place of youth, hope, opportunity – or “Africa: the Dark Continent” – a place of death, poverty and despair. In this case, clearly the media chose the former face of Africa. The problem with either side of this coin is that it misses the nuance that is so important to understanding what is happening economically and socially in the diverse countries that comprise Africa. Reporting of this story hopes to portray Africa in a positive light, and seems to stay away from the more complicated, countervailing themes of income inequality and poverty. Journalists conveniently ignore problems or trends that cannot and should not be ignored. One of the first trends I noticed in the reporting on the billionaires was a focus on the presence of several women on the list. As a feminist and women’s advocate, I am certainly pleased to see women doing well for themselves economically in Africa, independent of men. Reporters seemed to have fun with the female aspect of the list, with fun tag lines like “move over Oprah”, referencing the wealthy and powerful American who, according to this list, is no longer the wealthiest black female in the world. She has been replaced by Folorunsho Alakija, a Nigerian fashion designer and oil tycoon whose estimated worth is over $7 billion. But again, my thoughts go back to “why does this matter?”. It brings up questions that I struggled with throughout gender-focused courses in grad school. Does the presence of a few female billionaires mean empowerment for everyday women? Two other women heavily referenced in this context are Isabel Dos Santos, an investor and the daughter of Angolan President, Eduardo Dos Santos, and Mama Ngina Kenyatta, the widow of Kenya’s first President. While I would like to assume that these women are billionaires based improving economic conditions in Africa, I am fully aware of the nepotism and cronyism that plague industry and politics alike in Africa, I’m not so certain their inclusion on this list is a sign of improved gender equality or women’s empowerment. The articles reacting to these seemed to think these women were bucking the trend of “big men” ruling Africa, but at least two seem to have their wealth simply because of their connections to “big men”. Another thing the reporting basically ignored, or chose not to delve in to, is the geographic disparity of where the billionaires are from. Of the total 55 billionaires, 20 are Nigerian, nine are South African and eight are Egyptian. The fact that 20 of the 55 billionaires are from Nigeria is interesting. It’s no secret that many of Africa’s nations are plagued by corruption in politics and business. And Nigeria in particular is notorious for this, ranked the 37th most corrupt nation in the world. This known fact combined with the country’s disproportionate share of billionaires should raise some red flags. And furthermore, South Africa and to an extent Egypt are known economic outliers in Africa, with GDPs that far outpace most of their African neighbors. The last aspect I’ll touch upon that I believe was underreported is the industries in which the billionaires on the list made their money. It’s no surprise that oil and gas industries are heavily represented on this list, particularly out of Nigeria. It’s also no surprise, at least to those of us interested in the environment or West Africa or both, that Nigeria has a dismal track record when it comes to oil and gas exploration. Their environmental practices are ruining the Niger delta, workplace safety is almost nonexistent, and corruption within the industry and government relations remains abundant. Not to mention the incredibly detrimental impacts of these trends on Nigerian communities who rely on the oil and gas industry for jobs. Obviously oil and gas was not the only industry on the list. Fields like telecoms, manufacturing, financial services and construction are also represented on the list, which I believe does evidence a changing and improving economic situation in Africa, as these are not extractive industries that have the potential to create long-term, skilled employment for Africans. However, based on what I gathered from the list, these industries are mostly gaining strength in South Africa and they may not yet be viable industries in all African countries. So there you have it. My long-winded reaction to a very small piece of news that was both over-reported in terms of coverage, and underreported in terms of content and context. But where does it leave us? I can only speak for myself, but it leaves me with hope and a sense of challenge. It leaves me with hope because, yes, it is positive that entrepreneurship is taking hold in Africa on a larger scale than previously experienced. But the challenge is what I sense more – the challenge to change the way we view economic development. To dig deeper beyond the surface level “billionaires exist” to the more complex, and certainly more worthwhile ideas of who does this benefit? How did those billionaires come to be? And perhaps most importantly – what does this mean for the life of the everyday individual struggling to provide for their family? In essence, I’ll care more about these billionaires, these outliers, when I hear how they use their economic power to change the industries that made them wealthy – from industries that allow a few to capitalize, to industries that offer viable and safe livelihoods for the communities and families and everyday people who live in the African countries that they too call home.